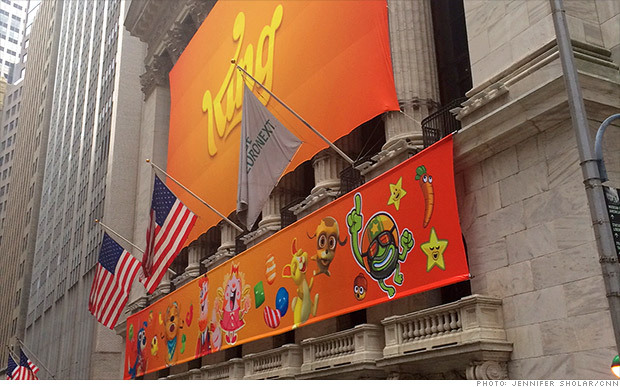 Candy Crush maker King Digital Entertainment opened for trading on the NYSE Wednesday. Investors may not have much of a sweet tooth. King Digital Entertainment (KING), the maker of the addictive online game Candy Crush Saga, dropped 15.5% from its offering price Wednesday. The stock priced at $22.50 per share but finished the day at $19. King sold 22.2 million shares and raised $500 million from the offering. JPMorgan Chase, Credit Suisse and Bank of America Merrill Lynch were among the top underwriters for the offering. Based on its current share price, King is worth about $6.5 billion. By comparison, rivals Zynga (ZNGA) and Activision (ATVI) sport valuations of $4 billion and $14.6 billion, respectively. The disappointing performance of King in the early going may reflect concerns that profits may be too closely tied to what could be a one-hit wonder, according to Peter Garnry at Saxo Bank. "King Digital is putting all its energy into finding the next game that can leave the company less reliant on cash-generator Candy Crush," he said in a report. "Given what we have seen with other mobile games' trajectory in engagement, time is not King Digital's best friend." But Garnry added that King "has shown superior execution in gaming development and marketing." Candy Crush averages about 93 million daily users, who play the game more than a billion times a day, according to the company. King reported annual revenue of $1.9 billion and a profit of about $568 million, despite offering games to players for free. King makes money by selling virtual items to a small fraction of its users who wish to enhance their playing experience. But its growth has soared. Sales in 2012 were $164 million and it reported a profit of just $8 million. Despite its rapid gains, King's dependence on Candy Crush has some worried about its long-term viability. There are concerns that this could be a repeat of Zynga, which has been unable to the match the success of FarmVille. Related: On eve of IPO, how does King Digital compare to Zynga? Zynga currently trades for less than half it did when it went public in 2011. Still, Zynga has regained some lost ground and is up more than 20% this year. Shares of another mobile game developer, Glu (GLUU) has also surged this year. King's debut comes amidst a busy year for new offerings. There have been 53 new listings in the United States so far this year, according to IPO research and investment firm Renaissance Capital. In the same period last year, there were just 30 companies that went public. At that rate, the number of IPOs this year could rival last year's total of 222, which was the highest number since 2000. While the overall market has been volatile due to geopolitical concerns and the Fed's scaling back of stimulus, the average IPO has returned nearly 30% from its offering price, according to Renaissance.